If you've been following the hype train behind Destiny then you no doubt have huge expectations for it. Along with Watch Dogs, the game is easily one of the most hyped releases of this year. I'm one of few that has not paid much attention to the hype, since I don't really care much for the shooter genre. I must admit that I was quite surprised with how much I did enjoy Destiny however. It's definitely a solid game with a lot of replay value and it's quite addicting even with its shortcomings. For those that don't already know, Destiny is a first person shooter RPG developed by Bungie and published by Activision that is set in a future post-apocalyptic world. During a "Golden Age" mankind colonized planets throughout the universe but during an event known as "the Collapse" the colonies were destroyed and the only humans that survived were those living on Earth. The humans on Earth were saved by a circular celestial body known as "the Traveler". The Traveler allows the defenders of the last city on Earth (Guardians) to wield a magic power called "the Light". 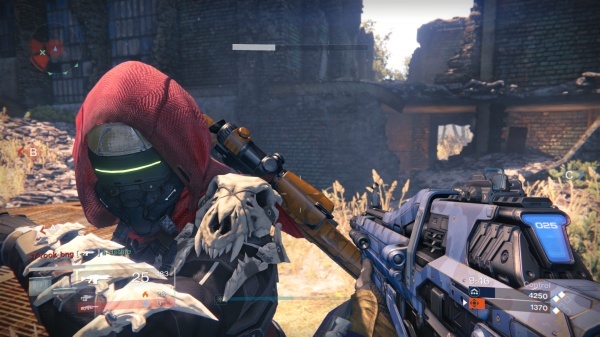 Destiny takes place during mankind's attempt at recolonizing other planets. While on their mission to take back the outer colonies Humans encounter an alien threat that has taken over their previous colonies and the aliens plan to invade the Earth colonies. From the start of the game, players can choose between three classes for their guardian - titan, warlock and hunter. Each class has their own subclasses and extra enhancements. The Titan class specializes in close-quarters combat and has subclasses that can either provide extra attack or defense. The Warlock specializes in recovery for both health and shield and its subclasses allow them to wield void and fire energy forces. The Hunter specializes in agility and has a gunslinger and blade dancer subclass. All three classes play just about the same besides the specialty attributes and the unique subclasses, so they all feel very similar for the most part. Players also get to customize the looks of the character. The options for customization are limited compared to other games, but you very rarely see your character's face since it is usually covered with a helmet, so it really doesn't matter. After creating a character, players will be introduced to their own personal "Ghost". 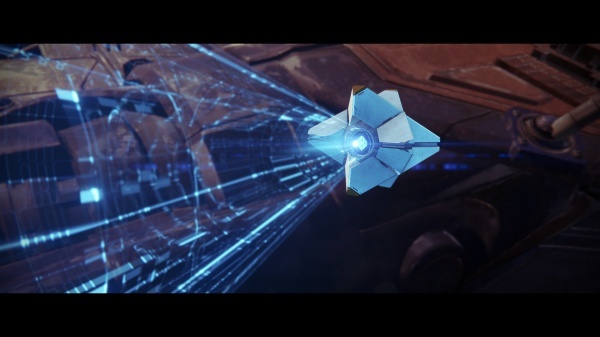 A Ghost is a type of drone that follows the player throughout the game and comes with a AI voice done by Peter Dinklage (from Game of Thrones). The Ghost helps a player out by providing objectives, communication, and examination of objects. The main enemies in Destiny are different types of alien races. Some are insect-like aliens known as "the Fallen" and there are android enemies known as "the Vex" as well as other types. Enemy AI will rush in and attack, stay back and shoot from cover or literally run off depending on the situation. The overall gameplay to Destiny is very solid. The controls work perfectly and the aiming is extremely exact. It's very easy to tell that Destiny was created by Bungie since the shooter gameplay is just as good as Halo. Each class can wield weapon types that include several varieties of rifles, magnums, rocket launchers, machine guns and other types. As already mentioned, each class has their own separate subclass that allows them to perform extra attacks. I mainly used the Warlock class, which has a Voidwalker and Sunsinger subclass that allows you to toss either void or fire grenades as well as having a super move that has the same elemental type as the subclass equipped. The abilities have a gauge that refills slowly after each use and so do the super moves. 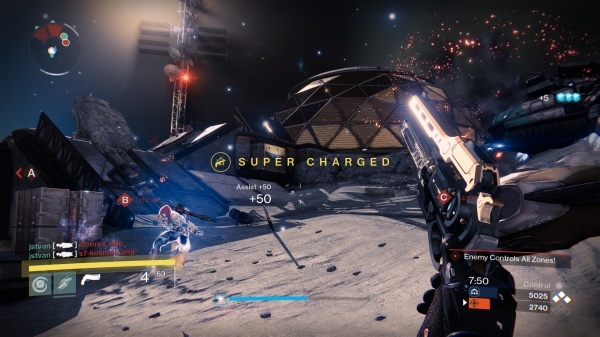 The super moves for the Warlock are either a powerful blast or enhancement. Equipment can be used to provide stat boosts and give extra bonuses (such as recharging your ability after ever melee kill). Some equipment can be leveled up along with your character. Equipment comes in different colors that show its usefulness and rarity. You have a certain amount of inventory but all equipment can be dropped from the inventory and it will be sold immediately. A player will receive "glitter" in exchange for sold items. Glitter is the main currency in Destiny and is received from defeated enemies, selling equipment or performing various tasks in the game. Equipment is visible during gameplay once it is equipped to your guardian so you can customize your overall armor appearance. The main story allows access to many planets and gives the player objectives to perform on each world. The planets on Destiny are often vast stages with tons of areas to explore. Sometimes chests full of items and other collectibles can be found in hard to reach or out of the way areas. I can't help but notice how lifeless planets can be during story missions however. When you start out in each stage, it often takes quite a while to run into enemies or find some form of life in the area. Enemies are pocketed in groups throughout a stage and often respawn in the same area once killed. Players can use a hover bike to race toward destinations much quicker. The story to Destiny is easily one of its worst points. The game has a near absence of story besides the little dialogue that the Ghost says before and during each story mission. Very few cutscenes are found in Destiny but once they occur, they are quite interesting. It's too bad that Bungie didn't spend more time with the overall story to Destiny since it has a cool universe that has the potential for a very epic story. Story objectives can almost be as dull with how repetitive they get. There are tons of instances where the Ghost has to scan an object and you have to defend the Ghost - this type of mission becomes worn out WAY too early in the campaign and is used long after it becomes tiresome. In between missions, you'll want to go to the Tower area in order to gain rewards and purchase valuable items and equipment. The Tower is basically a plaza where all players in the world of Destiny meet, so you'll see many random players in the area as well. Besides gaining new gear, players can gain and accept new bounties from the bounty tracker. The bounties are objectives that have to be met either in the campaign, on a strike or in the game's multiplayer. Players can buy new ships at the Tower, but all that does is give you a new ship skin to view on your loading screen. It's kind of useless to put out tons of currency on a new ship for my loading screen! The co-op experience in Destiny is quite cool whether you have a group of friends to play the game with or not. The game is an online only game so you can't play it without being connected to the internet, but it makes very good use of its online service even if you have no friends to play with. Every stage has the possibility of having random players in it. The random players can help you out or totally ignore you based on the player's choice, which you can do as well! All players are going through their own campaign or extra mission on the stage while you are busy with your own single player mission. Once you die, you can respawn within a certain amount of time. There are some areas that are called "No respawn zones" where players must start at a certain checkpoint if their guardian dies. The game also has missions called "Strikes" that are co-op only missions. These missions require a team of three players and are much harder than your standard story missions. The difficulty of the enemies increase and the there is a super boss at the end of each strike. In story missions there are bosses that are slightly bigger than normal enemies, but don't provide much of a challenge but in the Strike missions, the super bosses take TONS of hits to take down. Your team will literally be chipping away at the health meter of a Strike boss for quite a while before it finally goes down which adds much to the intensity level of the game. Strikes basically require the maximum amount of players on a team. Besides co-op missions, there are also multiplayer events at the Crucible where teams of six players can face off against another team of six. The matches that I played were your basic team deathmatch and fighting for control of three control points. It would have been nice if Bungie could have made the multiplayer fit into the story of Destiny somewhat, but it's pretty bare and your basic run of the mill multiplayer mode. If you're not a fan of multiplayer then that's tough since you'll have to engage in some multiplayer battles in order to unlock some bounties in the main game of Destiny. The overall graphical look of Destiny is quite amazing even on PS3. The PS3 version always ran nearly flawless to me. The overall framerate was smooth and saw only a hint of slowdown at times. The sound matches the game well, but none of the music really stands out to me. Peter Dinklage does a great job as the Ghost and other voice actors seem to do a good job in their roles as well. Overall, for a game that I thought I wouldn't care much for, Destiny greatly surprised me even with its shortcomings. The gameplay is very addicting and the game has a lot of replay value. If you can get into a game for its fun gameplay and replay value and not pay attention to its minimal story then Destiny might just be the game for you. If you're a player that requires an engaging story then skip over Destiny completely since you won't find much of story here. Final Rating: 79%. The game behind the big hype train has finally arrived and it's quite impressive even with its shortcomings!